Want to get the most out of investing in dividends? Follow these three guidelines. Do you have dreams of earning thousands with your portfolio? You're not the only one. Over the years, great investors have proven that fantastic returns can be made in the market using very different strategies. One method that has shown to be very effective, and one that almost anyone can use, is to invest in high-quality dividend stocks. These stocks that hand you a cash payment every quarter can be helpful in supplementing your income in retirement, or they can be reinvested and become a huge driver of future returns for you. One component of this strategy is to buy great dividend-paying companies that will continue to pay you in increasing amounts quarter in, quarter out. The big challenge is to find those great stocks. So here are some questions to ask when picking dividend stocks for your portfolio. Answering these three questions is a great way to identify whether a dividend stock will generate a hefty return or leave you empty-handed. Typically a stock with a reputation as a reliable dividend payer is one that generates lots of cash and doesn't have enough outlets to reinvest that cash at a reasonable rate of return. Companies in this position can mostly be found in mature markets, where growth is modest and trying to outgrow the market leads to diminishing returns. In markets like this, it can be easy to see revenue stall out if there isn't another lever to pull. One critical tool that companies should have in their arsenal is the ability to raise prices of goods or services without taking a bite from their customer base. To have pricing power, you need some kind of competitive advantage. There is quite possibly no better example of a company with pricing power than cigarette maker Altria (NYSE:MO). For more than 40 years, demand for the company's signature products has been in structural decline. Yet the company has the the ability to raise prices such that Altria continues to increase overall revenue. Not all competitive advantages necessarily translate to pricing power; technology and patent protection, for example, can be fleeting. It's advantages like brand recognition, high switching costs, or being in a government-regulated industry which allow a company to command pricing power. Finding companies with these traits is a first step in picking great dividend stocks. Having a strong revenue base that a company can control with pricing power is important, but it's only one part of the equation of profits. In order to capitalize on that revenue stream, the company needs to be able to control costs and spending, to ensure an ample supply of cash coming in the door. One major misconception investors have about dividends is assuming they come from the income statement -- so too much attention is paid to the payout ratio. The problem with this view is that earnings figures can be skewed by non-cash considerations like depreciation or gains from an equity investment; they aren't necessarily a reflection of the cash position of the company. So when looking at dividend stocks, one of the most important financial documents to examine is the cash flow statement. There, you want to look for items such as cash from operations, capital expenditures, and other cash outflows. To be a truly great dividend stock, the company should generate enough cash from operations to cover its capital expenditures, pay its dividend to shareholders, and have money left over for other things such as paying down debt or buying back shares. A great example of a cash-generating dividend stock is oil services giant Schlumberger (NYSE:SLB). Even though earnings can vary wildly because of non-cash considerations, Schlumberger has consistently generated cash well in excess of the amount it spends on capital expenditures and its dividend to shareholders. This gives the company ample room to ride out tough times in a market like today's energy market, but it also leaves room to do other things like buy back gobs of stock when the times are really good. Does it have a dividend reputation to maintain? Being a company with a long record of maintaining and raising dividends annually is revered by investors, so companies with long histories of consistent dividends typically want to keep that reputation intact. We even have a name for companies that can maintain their dividend streaks for more than 25 years: "dividend aristocrats." When a company achieves this level of success, it typically will do everything in its power to maintain it. For investors like us, it's a nice reassurance that management is going to do right by you over the long term. One great example of this is ExxonMobil (NYSE:XOM). The recent decline in oil and gas prices has really put a damper on the company's ability to generate cash and pay for all of its capital spending and dividends. Based on the company's cash flow statement, it would be understandable if it did decide to cut its dividend payment. However, the company has a 32-year streak of increasing dividend payments that it wants to uphold, because it realizes that payment is a major reason so many people own its stock. So it has gone to great lengths to shore up spending levels, lower operational costs, and even use the strength of its balance sheet to keep that dividend streak alive. Either companies with long streaks have that dividend aristocrat status, or they are very close to getting there and don't want to end their streak before reaching it. There's no guarantee that a company with a history of dividend raises will continue the tradition, but it certainly helps. 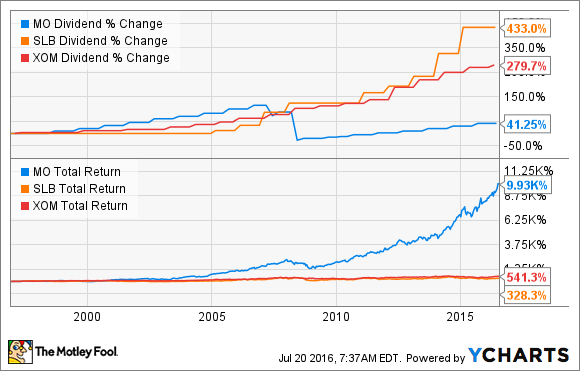 Investing in dividend stocks is an extremely powerful way to grow wealth over time. Let's be clear, though: investing in dividends isn't going to make you rich tomorrow. The power is in identifying the great companies that will continue to pay you for many years into the future, and owning those stocks over the long haul. Answering these three questions should help you identify the "great company" part of that equation. It's up to you to have the patience to hold on to your investments through thick and thin.